The CRG Business Board, an advisory body whose mission is to provide guidance in business development, investment, entrepreneurial and innovation strategic activities, has been reshuffled. This non-executive board will provide expert advice in entrepreneurial and commercialization activities while assisting the Technology and Business Development Office in positioning the CRG at the national and international levels in technology transfer. The Centre for Genomic Regulation (CRG) is an international biomedical research institute of excellence whose mission is to discover and advance knowledge for the benefit of society, public health and economic prosperity. In addition to being a world research leader in life sciences, providing interdisciplinary training for the next generation of scientists, one of the CRG’s goals is to translate new scientific knowledge into benefits for health and value for society. To this end, the CRG Technology and Business Development Office has redefined its priorities and the way it brings innovative ideas to the market, launching several new programs and activities to promote commercialization and entrepreneurship. The latest change has been the reorganization of the CRG Business Board. “Research institutes, especially those focused on basic research, can sometimes distance themselves from the culture of innovation and entrepreneurship. Their nature as knowledge centres and their focus on the preliminary stages of research can explain this apparent shortcoming. That’s why research institutions need qualified and professional teams who capture the value of scientific results and turn them into innovations,” says Pablo Cironi, head of the Technology and Business Development Office at the Centre for Genomic Regulation. “We have increased our scouting and technology assessment activities and launched several initiatives to promote the spirit of innovation and entrepreneurship among CRG researchers, from training sessions, to seminars featuring grants or programmes promoting collaboration between scientists and entrepreneurs or companies. In this framework, we also wanted to reorganize the Business Board to make it more international and adapt it to the new CRG technology transfer strategy,” says Cironi. The new CRG Business Board has six international members who are leading experts in entrepreneurship, business development, and technology transfer. 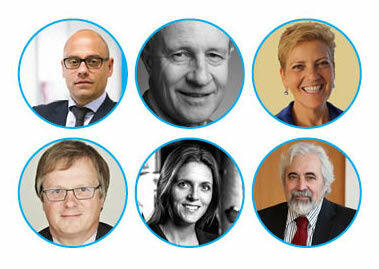 In keeping with the new technology transfer strategy as well as the institute’s international profile, the board now includes private investors (from international venture capital firms and business angels) and experts from the fields of pharma, biotech and academia, all with solid experience in the life sciences and biotechnology sectors. The new members of the CRG Business Board are: Joël Jean-Mairet, General Partner at Ysios Capital Partners; Rudy Dekeyser, Partner at Life Science Partners; Michal Preminger, Executive Director and Director of Business Development at Harvard University; Jean-Jacques Degroof, Business Angel; Antonio Parente, President at GP-Pharm; and Clara Campàs, Strategy & Development Director at Kern Pharma s.l. “We are now an international team of individuals with different backgrounds and areas of expertise, which will make a difference in transforming and boosting CRG innovation at the national and international levels. We are also a more compact team, which will be really positive in terms of being more effective and flexible,” says Antonio Parente, president of GP-Pharm, and standing member of the CRG Business Board. “Our mission will be to provide guidance without taking an active management role. It is a great initiative, which will establish a forum for discussion while contributing to the CRG goals of translating knowledge into benefits for society,” concludes Parente.